I wanted to mark my come back to the cooking world with a flavorful and fresh salad to complement the summer heat and I could not think of anything better than the Avocado and grilled Shrimp salad. 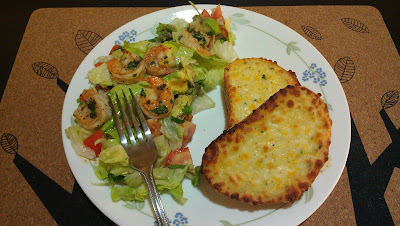 With the fresh lettuce, perfectly ripe avocados, juicy tomatoes and fresh shrimp…… could not have been any better. The salad was just right for the summer and is a keeper and the highlight of this whole salad is the time it takes to make this, I can say is jiffy!!! Keep all the salad ingredients separate and refrigerate until ready to eat. Mix all the marinade ingredient in the zip lock bag and refrigerate for couple of hours or atleast half hour if you have less time.Heat over @ 375 degrees and the put it on broil. Place the shrimp along with the marinade liquid and grill for 15-20 mins. Keep the juices released after grilling to use as the dressing. Mix all the salad ingredients and add the grilled shrimp on top and pour in the marinade liquid. Sprinkle salt and pepper if needed. Serve it with garlic bread or just plain baguette.